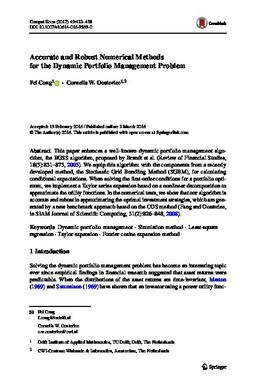 This paper enhances a well-known dynamic portfolio management algorithm, the BGSS algorithm, proposed by Brandt et al. (Review of Financial Studies, 18(3):831–873, 2005). We equip this algorithm with the components from a recently developed method, the Stochastic Grid Bundling Method (SGBM), for calculating conditional expectations. When solving the first-order conditions for a portfolio optimum, we implement a Taylor series expansion based on a nonlinear decomposition to approximate the utility functions. In the numerical tests, we show that our algorithm is accurate and robust in approximating the optimal investment strategies,which are generated by a new benchmark approach based on the COS method (Fang and Oosterlee, in SIAM Journal of Scientific Computing, 31(2):826–848, 2008).